With 250GB of internal or removable solid state storage options you can stream live, HD video at the lowest bit rates for bandwidth constrained applications, while recording hundreds of hours of HD video directly on the encoder. Featuring an intuitive UI, easily export your stored content to FTP servers or Haivision’s media management solutions. The Makito X with Storage represents the ultimate in redundancy for your live video content. With 250GB (expandable up to 1TB) of either fixed or removable storage, the Makito X with Storage can record up to 5 days at 5Mb/s or 30 hours at 20Mb/s. Removable storage is powered by industry standard 2.5” SATA SSD drives, giving you the option to quickly remove a drive once full, and allowing for content backups regardless of how close you are to your main storage/server facility. The Makito X with Storage is built with multiple encoding cores, allowing you to stream live video at low bitrates while recording up to two high quality streams directly onto the encoder and maintaining KLV metadata in the TS file format. The Makito X with Storage is the perfect encoder for situations where bandwidth availability is limited and keeping a high quality master for further review, archiving or post production workflows is necessary. Both .ts and .mp4 files are supported. The Makito X with Storage can be programmed and controlled remotely through command line, web UI, and SNMP APIs. You can set a time or size limit on the recording segments allowing for easier management of your video files. Simply upload your video from the Makito X with Storage to a USB, SD Card, Haivision Video Cloud, Haivision Media Platform, FTP, or NFS. 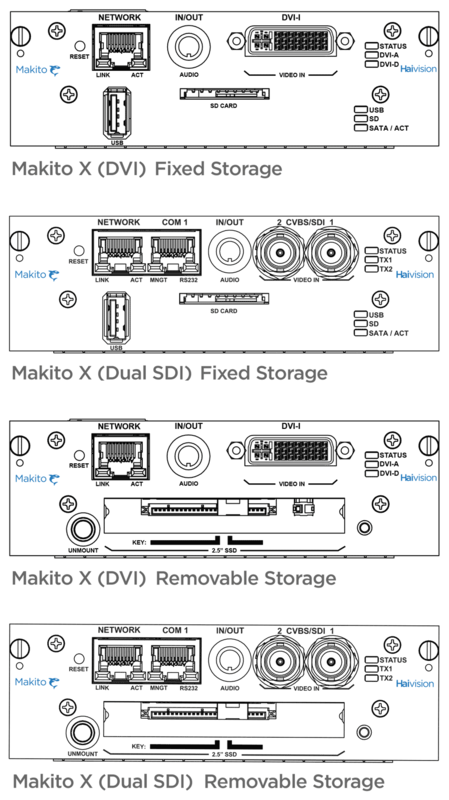 Available in double-height blade format for high density applications, the Makito X with Storage can be used in headends or remote installations for unparalleled performance and flexibility within a 1RU 6 input or 4RU 12 input chassis. The Makito X with Storage is also available as a compact and portable encoder, making it a great addition for remote interviews or remote streaming workflows.